In this post we’re going to see how you can save and load your data in UE4 using the provided API from Epic. We will start by saving and loading primitive data and then move on to save complex data (ie custom classes etc.). For this post, I’m using the 4.15 version of the engine, so in case you’re following this post with a different version you might have to change your code a bit to match the API of your version. Serialize our data using an Archive, meaning we will convert our data into a format that can be stored – in this case, we’ll convert the data into binary. In UE4, the code snippets for serialization and deserialization will be same. This means that we’re going to write a function that saves and loads data (I think that this idea is originated from Rama). By having a single code snippet for these two tasks, we end up having less code and therefore the debug process is easier. However, I would not recommend this approach in general. Two different functionalities should be split to avoid confusion in the long run. For this post, I’m using the Third Person C++ Template so I can access the player’s class code. I suggest you do the same since all the code provided below is going to be in that class. We’re going to use that file for save and load. If we attemp to save and this file already exists, it’s going to be overwritten. In case you don’t want that, you can store your data in a different location by using a FString type. In line 25 of the above snippet you will notice that we’re passing a TArray<uint8> into the LoadFileToArray function, however, in line 11, we’re passing a FBufferArchive to SaveArrayToFile function. The reason that both work, is because FBufferArchive inherits from FMemoryWriter and TArray<uint8>. For more information about that, check out this header file in UE4’s github repo. If the link doesn’t work for you, you have to connect your GitHub account to your Epic account so you can gain access to the source code of the engine. Since we’re loading binary data and we’re attempting to deserialize them into actual values, we have to be sure that we’re deserializing values in the same order we serialized them. This is the core concept of having the same function for both save and load. In the end of this section, I have uploaded two screenshots that showcase the result of a different deserialization order. 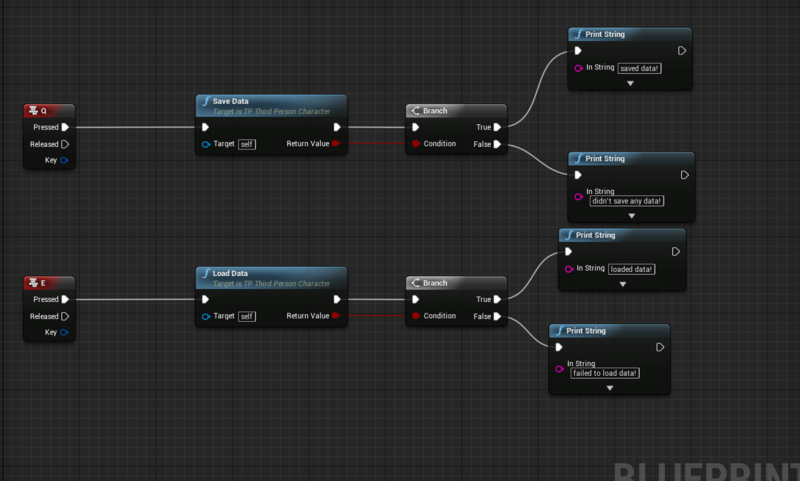 To test the save and load, provide some random values from within the Blueprint and then save these using the Save Data function. Then, stop your game, reset all values to 0 and attemp to load your data. Your data will be loaded just fine! Both deserializations come from the same serialized file! In the previous section we saved primitive types that already exist in the engine’s API. Fortunately, it’s quite easy to save and load complex types (for example custom classes). To do that, we have to extend the << operator of the FArchive class, in order to support our custom class. A friend function is a function that is able to access the private members of class. By using the friend keyword in this case we’re “extending” the FArchive class in order to support our custom class for serialization and deserialization.